Mario Tama/Getty ImagesAlexandria Ocasio-Cortez, a US House candidate in New York. Alexandria Ocasio-Cortez sparred with the conservative pundit Ben Shapiro on Thursday after Shapiro challenged her to a debate. Ocasio-Cortez, a 28-year-old Democratic US House candidate in New York, accused Shapiro and his allies of harassing her, comparing their behaviour to catcalling – and something to which she’s not obliged to respond. Shapiro then accused Ocasio-Cortez of “slandering” him. Alexandria Ocasio-Cortez, a rising star on the left, sparred with the conservative pundit Ben Shapiro on Thursday after Shapiro challenged her to a debate in exchange for a $US10,000 campaign donation. 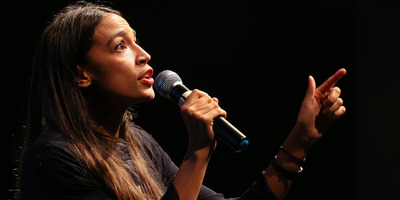 Following a chorus of calls on the right for her to take Shapiro up on his offer, Ocasio-Cortez, a 28-year-old Democratic US House candidate in New York, accused Shapiro and his allies of harassing her. Shapiro, a conservative millennial commentator who edits the right-wing website The Daily Wire, quickly condemned Ocasio-Cortez’s suggestion that his offer was made in bad faith. Ocasio-Cortez, a Democratic socialist who stunned Washington when she defeated the powerful incumbent Rep. Joe Crowley in New York’s primary in June, has developed a robust social-media presence, and her tweets often go viral. Shapiro is not the first in conservative circles to offer to debate liberal politicians with more power and influence – Republican Sen. Ted Cruz of Texas repeatedly challenged President Barack Obama to debate policies like the Iran nuclear deal. Many on the left criticised Shapiro for what they viewed as a gimmicky provocation designed to earn him media attention, something of which Shapiro himself has been critical. OpenSecrets, an arm of the nonpartisan Center for Responsive Politics, noted in a tweet that a $US10,000 donation to Ocasio-Cortez’s campaign would violate campaign-finance regulations for individual donations.